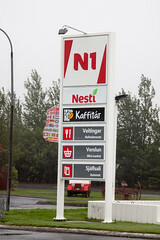 N1 is probably Iceland’s largest retailer, running a rather large (by Icelandic standards) chain of over 100 gas stations, ranging from self-service kiosks (which proved to be relatively good at defending themselves from any attempt of mine to exchange a US-based credit card for diesel, even my Chip-and-PIN card) to full service stations. But one thing is almost a given if you are doing like I and travel around Iceland, you will eventually find yourself hungry and in need of food, and through location, time, or other factors, N1 is going to be your best option. Indeed, I’d say that in a substantial fraction of Iceland, the nearest prepared food of any sort is actually an N1 station. So, no matter how much you may be reluctant to do your dining at a gas (err, “petrol”) station, you may find yourself faced with exactly that scenario, so I figured I should tell you what you are in for. But if it’s an N1 that’s at all staffed, there’s a good chance they at least have hot dogs (since the Icelandic love their hot dogs), and probably a full food menu as well. This N1 station in Hvolsvöllur (shown here) is actually a pretty good example of what a “better than average” N1 station is like, with three food service options on-site. There’s a location of Kaffitar (“The Starbucks of Iceland”), although it wasn’t open when we came through. It also has one of N1’s Nesti food service counters, which serve a variety of burgers, fries, and the like (including lamb, of course) in a fast-food manner. 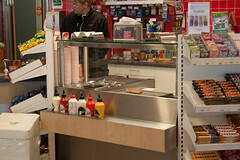 And of course, the main cashier also has a little hot dog stand, usually with both regular and bacon-wrapped hot dogs. So, how is an N1 hot dog? Well, I’ll be honest, it’s not much different than the other dogs I had throughout Iceland. The typical longist lamb hot dog, served up with the same condiments, although N1 only applied the fried and fresh onions, leaving the mustard, ketchup, and remoulade up to you to apply as desired. Like the previous place, N1 also offers to toast up your bun for you on a panini press. The result is an above-average dog. 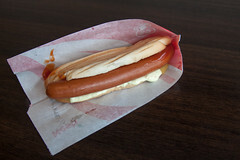 Really, in the end, I liken it to getting a dirty water dog in New York City: it’s not the best of choices, but it can be a flavorful one at times, and one that doesn’t lighten your wallet. Well, in the end, it’s not haute cuisine. But it’s one of the most common, and most commonly available, food items all across Iceland. And you can do worse. A lot worse. The next stop on our Boston March was the Super 88 in Allston. Super 88 is a regional chain of Asian grocery stores (now part of the larger Hong Kong Supermarket chain), and the Allston location opened to much fanfare in 2002. In addition to having good Asian produce and seafood section, it also had an onsite bakery and a really good selection of basic Chinese groceries. More importantly, however, was that the front of the store was made into the “88 Food Connection”, a small food court featuring half a dozen Asian food vendors, including Korean, Japanese, Vietnamese, Bubble Tea, and other wonderful spots. It’s a great little place to meet up with friends and grab a quick Asian treat, so we decided it was also a good stop on the March. And one of those vendors, Pho Viet’s, is one of the better places around Boston to grab a Banh Mi sandwich.